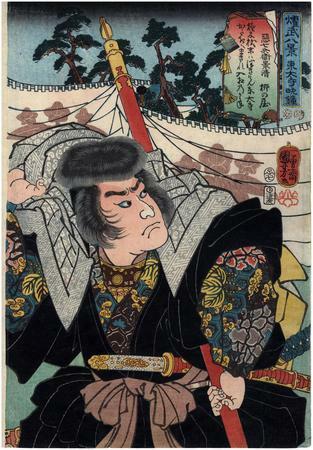 Robert Schaap in his Heroes & Ghosts:Japanese Prints by Kuniyoshi 1797-1861 wrote: "Akushichibyōe Kagekiyo (Bad man of the seventh degree) Kagekiyo (died 1195), here seen in the black and grey clothes of a monk holding a naginata (spear). The scene refers to the legend that he went to Nara disguised as a priest with the intention to murder Minamoto Yoritomo (1147-99). He was however discovered and is said to have blinded himself in order to avoid seeing the triumph of his enemy. This scene is compared with Vesper bell at Tōdaiji (temple) from the Eight views." See also Robinson The Warrior Prints, p. 156.